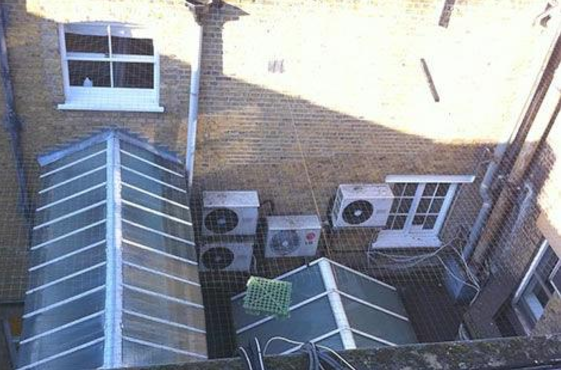 This large courtyard enclosure shows areas where pigeons have been roosting under air conditioning units, window ledges and on waste pipes etc. We recommended installing a 50mm pigeon netting system on the above parapet wall closing the light well totally, and preventing pigeons from entering this area. 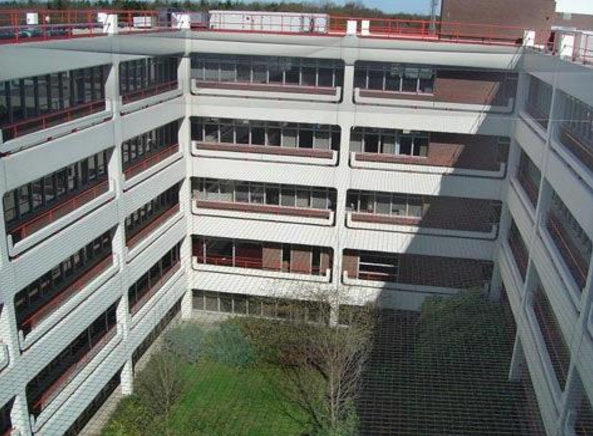 This commercial office building suffered from pigeons nesting and roosting on the balcony areas and window ledges. This prevented tenants from using the area, as it was contaminated with pigeon faeces. If you look closely you can see the 20m x 40m pigeon netting preventing pigeons from entering the enclosure.